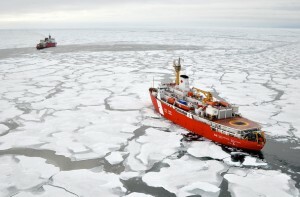 Senators pan Arctic agreement as Canadian leader visits U.S. When a U.S. president and a Canadian prime minister meet, it’s not a given that the Arctic will be on the agenda. But this morning, on Prime Minister Justin Trudeau’s first official visit to Washington, D.C. the two leaders released an agreement on the Arctic, energy and climate. Alaska’s senators aren’t happy with it. The Arctic portion of the agreement calls for a “new partnership” to build an economy that protects the environment. 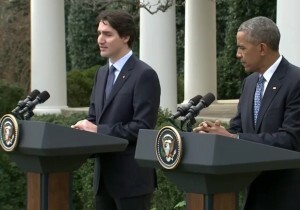 In a White House press conference, Trudeau said the partnership foresees science-based standards for various Arctic activities. “From fishing in the high seas of the Arctic, as well as set new standards to ensure maritime transport with less emissions, the partnership will also support sustainable development in the region,” Trudeau said before the session was opened to questions from reporters. The Arctic statement says both countries “reaffirm” their national goals of protecting at least 17% of land and 10% of marine areas by 2020. And, it says, they will also lead an effort to persuade the other northern nations to develop a pan-Arctic network of marine protected areas. Among other details, the two leaders are also pledging to work together to establish low-impact shipping corridors. In the energy and climate portions of the agreement, they agreed to reduce methane emissions from their oil and gas industries by at least 40 percent by 2025, and end routine gas flaring. Environmental groups promptly lauded the agreement. Gov. Bill Walker said he was disappointed Alaskans weren’t consulted in crafting it. Sen. Dan Sullivan says he and Sen. Lisa Murkowski couldn’t get information about the agreement until a briefing two days prior. Sullivan says they even tried contacting the Canadian Embassy, because no one from the U.S. government was returning their emails. Sullivan says the agreement promises what he calls “legally suspect” oil and gas regulations and is often vague. Sen. Murkowski, in her own statement, says the agreement seems to give Canada a partial veto of development decisions in Alaska. Her spokesman pointed to a sentence that says if Arctic oil and gas activity proceeds, it must align with “science-based standards between the two nations” that ensure operators are prepared for Arctic conditions. Neither Alaskan was among the border-state senators invited to the State dinner at the White House. The guest list includes prominent Canadians in entertainment, such as “Saturday Night Live” producer Lorne Michaels, and actors Sandra Oh, Mike Myers and Michael J. Fox, as well as Trudeau’s mother, Margaret Trudeau, and his in-laws. Alaska was represented on the menu, with halibut “casseroles” as the first course.